Downalong, St. Ives, is a labyrinth of narrow cobbled streets and alleyways; it is a network of granite cottages, converted sail-lofts and pilchard palaces that now house studios, craft workshops and galleries. They radiate from a harbour which has appeared in countless paintings and photographs. The Mariners’ Church, home of the St. Ives Society of Artists, forms a majestic foil to the jumble of smaller buildings. It can be seen from almost every vantage point. It is central to the view and it is also a central location in the story of the artists’ colony. In the 19th century fishing was the business of the town. The harbour was busy with boats. 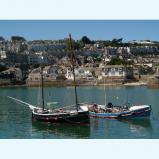 Three fleets, mackerel, herring and pilchard, were all moored in the bay when they were not at sea. The fast-sailing herring fleet were lugger-rigged boats which had followed the shoals from Whitby, Sunderland, Hartlepool and Scarborough, round the north of Scotland to the Isle of Man and into the Irish Sea. Another large fleet was engaged in transporting pilchards to Mediterranean ports. 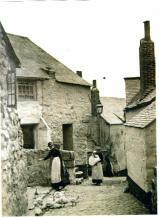 Between 1829 and 1838 St. Ives supplied the Italian market with six thousand four hundred hogsheads of pilchards annually. The town lived from fish, but the life of the community revolved around its churches and chapels. There were never enough. The Anglicans had leased an old loft, known as ‘The Long Run’, and it had served as the Church Infant Schoolroom for many years. In 1867 it became the School Chapel. This was done in time for the herring fleet’s return. A harmonium was installed and regular services were held for fishermen and their families. Fishermen who attended, observed that ‘the church services were not as boring and dreary’ as they had been led to expect. 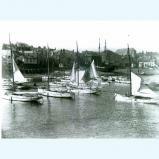 In 1892 the Anglican vicar of St. Ives, Cannon John Balmer Jones M.A., proposed that a new church be built for fishermen. It was only after his death in 1901 that funds were raised to make his dream a reality. The site containing the Chapel was finally purchased in 1903 by the Anglicans and plans were created for a new Mission Church. The church was erected as a permanent memorial to the priest. The architect Edmund Sedding, of Plymouth, designed an imposing gothic building intended to strengthen the Anglican congregation within the fishing community. The building was never completed. The niches never got their saints and the bell tower never got its spire. 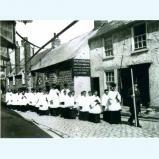 However, in 1905 the Bishop of Truro dedicated the building to St. Nicholas, the patron saint of fishermen and children. A procession through the streets from the Parish Church was followed by a choral celebration of Holy Communion. The church was designed to accommodate 270 people, but only a meagre congregation of 100 attended the opening. The fishing families were mainly non-conformists. John Wesley himself had made twenty-seven visits to the town. Wesleyan Methodism was strong, but there were also Primitive Methodists, Bible Christians and many other rival factions. Their disaffection with the Anglican Church was due in part to an age-old dispute over tithes levied by the Church on fish landed in the harbour. This fact, coupled with the demise of the pilchard industry and the tragedy of the First World War taking its toll of young men, meant that the new venture was doomed to fail. By the early 1940s the church had fallen into a state of disuse and disrepair. During the Second World War, Smeaton’s Pier was used as an embarkation point for the home and allied troops for deployment in Europe. The church itself was requisitioned as a field hospital and used by the St. John Ambulance Brigade and the Red Cross. 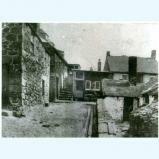 In 1945 it became the permanent home of the St. Ives Society and renamed the New Gallery. 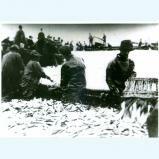 For many centuries pilchards were big business in the town, but by the 1880s the industry was in decline. The great shoals of silver no longer appeared in the bay. This may have been due to a warm current in the sea which had moved away from the coast. Others ascribed it to mine closure and the absence of the red water which had run in rivers from the working mines ‘thickening the ocean.’ This, they claimed, had attracted the pilchards. Whatever the reason, many of the pilchard palaces and net-lofts and the workshops of boat builders, coopers and blacksmiths became redundant. They were empty shells waiting to be re-colonised and they made fine studios. So the artists moved in. 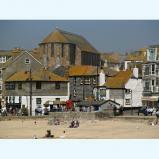 Artists had been visiting St. Ives for many years. Turner had been twice and in the 1860s John Brett and the marine artist Henry Moore both became regular visitors. However, it only became practical to consider living there after the arrival of the railway, which made it possible to transport large paintings back to London for exhibition. 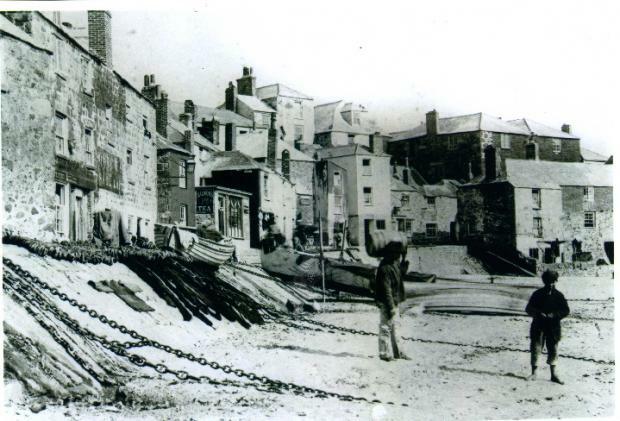 St. Ives was an ideal town for the marine painter, because the peninsula offered a wide variety of coastal scenery and studio spaces were available. Geographically it was well west, so the climate was milder and it was possible to paint out of doors for most of the year. It was also well south; this meant a better balance of daylight hours, summer and winter, which really mattered at a time when workshops were still lit by candles. In 1884 the Right Honourable Duff Tolamache took a studio in an old sail-loft in Carncrows Street, Downalong. This is the first record of an actual studio in the town. In the same year Whistler arrived, with Walter Sickert and Mortimer Mempes, to overwinter in the town. They painted the restless sea on the inner lids of cigar boxes, trying to trap the energy of that moving mass on panels that measured nine by five inches. Their painting was about immediacy. Stanhope Forbes, the leader of the Newlyn School, referred to Whistler as ‘a dauber.’ Inspired by Bastien Lepage, Forbes was painting the fishermen at work. Sickert said that Lepage’s models were ‘frozen in time and space; they would never pick up their potatoes.’ Such arguments made the place healthy and alive. In 1887 James Lanham opened the first gallery. Julius Olsson and Louis Grier started the first school of painting in 1888. Olsson rapidly established himself as the leading seascape painter of his generation. 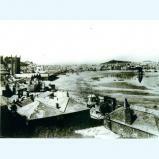 In 1889 the St. Ives Arts Club was founded. This was a centre where artists could meet and socialise. In the decades that followed St. Ives became a thriving cosmopolitan colony, with artists from France, Finland, Australia, New Zealand and the United States visiting regularly. Before the First World War, the Canadian artist Emily Carr wrote in her diary that there were ten private schools of painting in the town. They were relatively untouched by the experimentation that was taking place on the continent; they were mainly concerned with painting the sea. During the war many young artists left the colony to fight. Studios were reoccupied after the war, but a number of the older artists felt that the standard of painting in the town was on the wane. In 1920 Bernard Leach arrived with the Japanese potter Shoji Hamada to build a climbing kiln at Higher Stennack. Leach wanted to bridge the gap between eastern and western philosophy through art. In 1925 French style reached St. Ives when Alec Walker moved his silk factory from Newlyn and joined forces with Patrick Heron’s father, Tom Heron, to set up the Cryséde Works in the town. 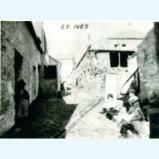 Borlase Smart and Leonard Fuller opened the St. Ives School of Painting in the spring of 1938. This was a goal they had committed themselves to in the trenches of the Western Front more than twenty years earlier. Smart had been living in the town following the war and persuaded Fuller to move from London to join him. Between them, they established the school in Denis Mitchell’s former studio, close by Wallis’s house, in Back Road West. The venture was an immediate success. On the 26th January 1927, the marine artist Commander George Fagan Bradshaw proposed the foundation of a society to raise the standards of the colony and to exhibit works which ‘mattered’ in artistic circles. Lanham’s Gallery was the temporary home of this fledgling Society, but by 1928 it had moved to Julius Olsson’s old studio in Back Road West. The following year all the studios were offered for sale and Moffat Lindner purchased the whole block to avoid them being turned into shops. Borlase Smart said that Lindner had prevented what might have been a serious crisis in the history of St. Ives art. Lindner was very supportive and enabled the Society to continue to use Olsson’s studio at a very favourable rent. In 1932 the adjacent studio, number four, was also rented due to the growth of the Society. Lindner became President and remained in the post for the first eighteen years. Many Royal Academicians became members of this new Society: the leader of the Newlyn School, Stanhope Forbes, Lamorna Birch, Julius Olsson, the Principal of the first private art school in St. Ives, Adrian Stokes, Dame Laura Knight, Sir John Arnesby Brown, Algernon Talmage, Sir Alfred Munnings, Sir Stanley Spencer, Sir Frank Brangwyn, Sydney Lee, Dod Proctor, Bernard Fleetwood-Walker and many other notable artists including John Park and Borlase Smart. The decision that transformed the fortunes of the Society was a brave one, taken in 1931 at the height of the Depression. This was to stage a series of touring exhibitions at municipal art galleries around the country; the first, in Huddersfield, was very popular. Subsequently over twenty-five separate art galleries hosted shows by the Society between 1931 and 1947. In 1947 a touring show was even staged in South Africa to coincide with the King’s visit. Borlase Smart, Secretary of the Society from 1933 until his death, was also its later President. He was the driving force behind its astonishing early success. Removed from centres of commerce and industry, the town was a safe place to bring up children during the Second World War. Adrian Stokes, the art critic who lived at Carbis Bay, encouraged the sculptress Barbara Hepworth and her husband Ben Nicholson to leave London and the threat of bombs and settle there with their triplets. They were followed swiftly by their friends Naum and Miriam Gabo. Gabo and his brother Pevsner had written a manifesto for the Russian Constructivist Movement in 1920 stating that real space and time were the things an artist must confront in the twentieth century if he wanted to be truly of his time. Soon Cubism, Futurism, Constructivism, eastern philosophy, true naïveté and the English marine tradition were being discussed behind the blackout curtains of the town. The place was a hotbed of creativity and its importance grew. 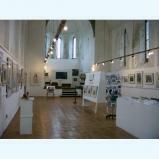 Borlase Smart welcomed the new artists and persuaded the Society to accept them as members. He gave the young Wilhelmina Barns-Graham his old studio. In 1946 he exhibited with Hepworth, Nicholson and Lanyon in his own studio. When the Society moved to the church, hanging committees tended to display the work of the more avant-garde in the area where the font had been. There, light levels were not good, but they were exhibiting. That same year Peter Lanyon, Sven Berlin, Guido Morris (the letterpress printer who produced most of the publicity for exhibitions in the colony), Dr. John Wells and Bryan Wynter held an exhibition in the crypt. There was another exhibition in the crypt in 1947 which displayed works by seventeen artists including sculpture by Barbara Hepworth and Dennis Mitchell. Wynter was unable to exhibit in this second Crypt Group show, but Wilhelmina Barns-Graham did. These exhibitions really represented some of the most forward-thinking and experimental art being created in Britain at the time. The Group’s final exhibition in 1948 included work by Kit Barker, Wilhelmina Barns-Graham, Sven Berlin, David Haughton, Peter Lanyon, Patrick Heron, John Wells and Adrian Ryan. There was plenty of criticism of these shows in the press. Even some of the old guard within the Society became quite vocal. Borlase Smart had died in 1947, so he was not there to defuse the arguments. At an extraordinary general meeting in 1948 Sir Alfred Munnings was elected President. That same year the new Secretary of the Society, David Cox, proposed that members should not show in all exhibitions by right. Shortly after this decision had been made, an exhibition was organised in Swindon and a number of members of the Society were excluded. There were heated arguments. Commander Bradshaw complained that ‘Cox had been doing too much on his own.’ Ten signatories supported the Commander’s protest and a meeting was called. In the furore which ensued many members resigned, including the whole of the Crypt Group. In a short space of time the Penwith Society of Arts in Cornwall was founded as a tribute to Borlase Smart, stating that they were pursuing his ideals. These were to present exhibitions of ‘the most vital art and craftsmanship, regardless of label, in the Penwith area of Cornwall.’ For many years his name appeared on all their catalogues. It was not a smooth transition and the members of the new society were soon falling out amongst themselves. Nicholson and Hepworth wanted to subdivide the responsibility for hanging the shows, with an academic artist selecting the traditional work and a craftsman selecting the craftwork. Nicholson said that he was not confident about judging the quality of a traditional painting. Peter Lanyon was appalled at this idea, saying that it went against everything Borlase Smart had stood for, and he resigned. Not to be outdone in celebrating the energy of their former President and Secretary, the St. Ives Society moved that a trust be founded in his memory to purchase all the studios in Back Road West from Moffat Lindner, who was then very elderly. It secured their future and allowed the Society to administrate them for the benefit of the artists in the colony. This was achieved with generous help from the Arts Council. The popularity of the Society had not diminished and in 1949 there were 11,000 visitors to the gallery and sales had doubled. An exhibition was held in the Crypt Gallery to celebrate the work of Frances Hodgkins, a New Zealander, who had lived in St. Ives during the First World War. This was partially funded by the Arts Council and indicated the standing of the Society. In 1950 another memorial exhibition was held for Stanhope Forbes, who had died in 1949. The same year Lamorna Birch replaced Alfred Munnings as President. At the AGM it was announced that the Church Council had agreed to rent the Mariners’ Church to the St. Ives Society of Artists for another year with the option of a further twelve months. At this meeting the Society exhibitions were reduced to three a year. Without the dynamic leadership of Borlase Smart, the Society deemed it too expensive to continue the programme of provincial touring shows, and in consequence the non-resident members ceased to exhibit with them. Soon it was the Penwith Society that was dominating the headlines. 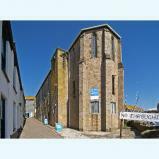 The Crypt Gallery was sublet to the St. Ives Operatic Society as a costume and props store and rehearsal room. The Coronation and Festival Exhibition of 1953, which was opened by Prince Chula Chakrabongse of Thailand, was intended to be a real showcase. The critics slated it. Financially it was a disaster and by October the Society was overdrawn at the bank. However eloquent the traditionalists may have been, there was little they could do or say to alter the change in attitude that was occurring. In 1956 the local Church Council announced that they were intending to sell the Mariners’ Church and the lease was to be terminated. If the Society was to survive it would have to buy the building. This was achieved with a generous loan from benefactors Dr. and Mrs. W. E. Glover. In his position as Chairman it was Commander Bradshaw who made the arrangements for repaying the loan and interest. It was decided to raise the annual subscription in order to ensure repayment. There was little argument and it was a proud day for the Society when they came to own their gallery. Commander Bradshaw, the senior surviving member of the Society and its founder, died in 1960 at the age of seventy-two. In 1972 the then President of the Society, Hugh E. Ridge, proposed that they reduce the number of exhibitions to two, March to June and June to October. The more senior members, who were also the Committee, were finding it too demanding to have to select and hang three exhibitions per year. This number was further reduced in 1979 to a single show. 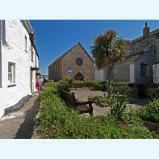 The St. Ives Operatic Society vacated the Crypt in 1990. For forty years it had been used as the rehearsal room for an impressive list of musicals and summer shows, but the growing number of props and costumes stored was fast becoming a fire hazard. 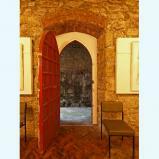 The fortunes of the St. Ives Society of Artists had revived and it was decided to refurbish the Crypt Gallery. 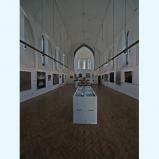 This was achieved with the enthusiastic help of members and it reopened in 1992 as the Mariners Gallery. It was offered for hire to individual artists, artists’ groups and art societies on a monthly basis and the applications flooded in. One of the major problems with any organisation is that it can ossify, but things changed and a broader approach could be seen. The diversity of exhibitions in the Mariners Gallery injected new life into the old Society. Returning to the ideals of Borlase Smart, the policy was to show work of excellence, both traditional and contemporary. This, coupled with the arrival of the Tate Gallery in the town, led to its rejuvenation. In 2004 Nicola Tilley was elected Chair and through her energy and enthusiasm things continued to develop in positive and exciting ways. With some help from Arts Council England, South West, the organisation was restructured and an annual programme of eight exhibitions was introduced. Three of these were members’ shows, but the remaining five represented the works of other artist groups. Most were selected and hung by respected curators who had no connection with the Society. These were controversial changes which led to some resignations. However, many applications to join came from young, dynamic artists attracted by the Society’s optimistic and progressive profile. By 2008 twenty-eight new members were elected. In 2007 the members hosted a changing programme of their own work in the Mariners Gallery. These complemented the shows in the main gallery upstairs, but still made it available for hire at other times of the year. Memorable recent shows have represented the work of artists from the Royal Institute of Painters in Watercolour, the Porthmeor Studios, the work of teachers from the St. Ives School of Painting, members of the Newlyn Society of Artists and mixed media and textile students from Cornwall College. Links have been made with Tate St. Ives, the Newlyn Gallery, Penlee House, the Borlase Smart Trust, Cornwall College, the St. Ives School of Painting, The St. Ives Archive Study Centre and numerous visiting colleges, whilst a programme of performances, lectures and workshops has established the Society’s place in the community on another level. 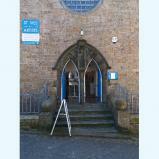 The Mariners’ Church has been the home of the St. Ives Society of Artists for over fifty years. 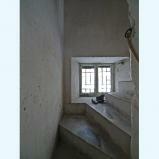 The building is over a hundred years old and in need of some essential refurbishment. Like all old buildings it constantly needs money, but the Society has survived the ebb and flow of its fortunes due to the dedication and vision of some of its notable members. There is real promise for the future.